Join Forces — When The Feast enters the battlefield, starting with you each player may pay any amount of mana. 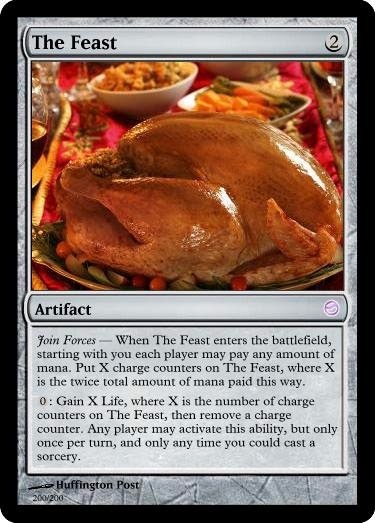 Put X charge counters on The Feast, where X is the twice total amount of mana paid this way. 0: Gain X Life, where X is the number of charge counters on The Feast, then remove a charge counter. Any player may activate this ability, but only once per turn, and only any time you could cast a sorcery. If you missed last year's card don't worry, you can check it out right here. We went with an artifact this time. Mostly because last year's was already a World Enchantment and you should be able to have both on the battlefield. We hope you enjoy our silly card! Have a Happy Thankgiving from Snow Covered Swamp! I actually have a bit of story behind this card. Back when I was a noob and not a Rules Advisor, this card functioned very similar to Blatant Thievery. Come to think of it, I don't even know how I thought it said "gain control of target permanent" now that I think about it. I should probably read the whole card. Whatever, it was kitchen table magic and nobody cared and let it resolve like that anyways. As for the actual card, it's pretty bad. In Limited I could see it being okay with typical "freeze" cards like Singing Bell Strike or Ice Cage but even still it's a really low value card and wouldn't make the cut... basically ever. But that would be the format it would be played in. Unless you make a gimmick enchantment EDH deck with Zur the Enchanter and Isochron Scepter. That could be fun. HEY GUYS LOLZOR HERE! ITS THAT TIME OF YEAAAARRRRRR!!!!! 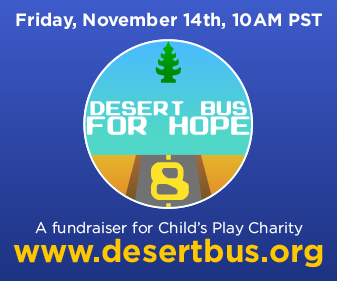 Alright guys I expect you all to be watching and donating. LOLZOR OUT! At the beginning of each player’s end step, that player may choose target opponent. 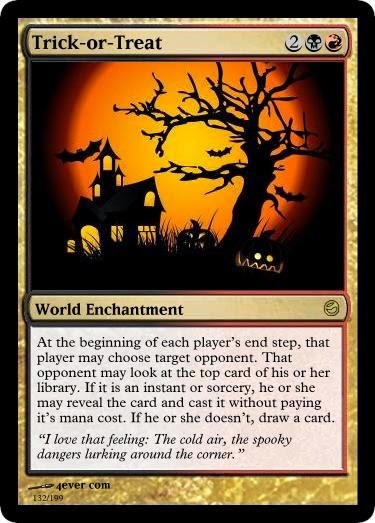 That opponent may look at the top card of his or her library. If it is an instant or sorcery, he or she may reveal the card and cast it without paying it’s mana cost. If he or she doesn’t, draw a card. We know, we know. We haven't updated our site in a few months but that doesn't mean we aren't active! As mentioned in one of the posts below we are shifting our medium from being pure text-based. Remember to check out our Youtube and Twitch.TV channels to see if we are live. Since it's Monday and we don't have a MUCMonday planned nor ready, here's a RCotD! Wow. What a bad card. It's a situational Shock and the times that you would want a targeted creature to lose flying is almost irrelevant. I'd almost say that Earthbind is better in every aspect--even card art. It's almost never okay in Limited and no one would even think about running it in constructed. Re-Introducing a new member of the SCS Crew, huh! Here you should be able to catch any of us: Baalhrezem(Sefah), Lolzor, or Spazmos playing a multitude of games. Many times together. We apologize for the lack of content on our site, but we have been refocusing our efforts on our stream, while we post highlights to our YouTube page. If you liked reading our articles (we know all of you are missing our MUCMondays), don't fret! We are going to try to get more MtG content on our blog. So stay tuned! Hey guys, Lolzor here, bringing you another featured clip from our Streams. This one is actually an older clip from one of our Hearthstone area's but we figured with the whole Fireside program going live today it was relevant. Basically it's us showing you how good #ValueBomber is and how to punish greed. Anyway we should be streaming Sunday after we prerelease and expect to see more content coming your way now that we have some breathing room in our normal lives again.